With heart-wrenching sadness we want to share with you that our beloved Tala (Wolf Connection’s founder) passed away Saturday February 27 after experiencing severe lung cancer for a few months. Being who she was, and is, Tala kept her signature high spirit and continued spreading her love … the volunteers that were working at the ranch that day can attest to that … she was animated, playful and loving … for Renee and I it was bitter sweet because we knew she was saying goodbye … she has been saying goodbye to the desert, the wind, the moon, the property that she dreamt. Tala has changed countless lives in her nine years with us … they say that the flames that burn the brightest don’t burn as long. Without her Wolf Connection would’ve never existed … the 60+ wolves we’ve rescued and gave good lives to would’ve had a different destiny, possibly been dead long ago. Without her the thousands of young people we have impacted in the last six years would’ve had a different destiny too. 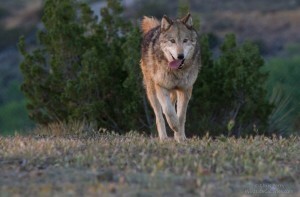 After almost a year of successful planning and working with authorities, Wolf Connection recently received the necessary permits to move the current wolf pack to the newly acquired 165-acre ranch in the mountains above Acton. 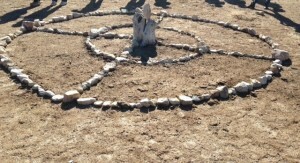 The human gang at Wolf Connection created a medicine wheel in the center of the new property to honor this magnificent land, and construction began almost immediately on the wolf enclosures, with the hopes that the wolves can move into their new homes in May 2016. The new location, surrounded by the Angeles National Forest, with its year round stream and prolific wells, will serve as a safe and permanent home for this pack and for generations to come. Teo Alfero, founder of Wolf Connection and one of the visionaries for this new project, intends to develop a solar-powered, certified green educational and therapeutic center that will inspire all who visit to learn how to live sustainably with the land, the animals and each other. The new ranch will be the home of a complex where youth and families from all walks of life can find healing and hope– a place where humans and wolves can work together to heal from the traumas of their past. 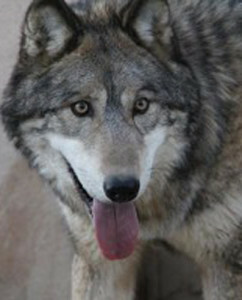 Teo believes that the animals at Wolf Connection are here to contribute, in their own unique way, to healing and prosperity for the world. According to some researchers (and many indigenous tribes) wolves have given us our humanity … we are who we are personally and socially because of wolves. This project will serve as a reminder … a place where people can re-connect with that truth and use it to move forward their individual lives and humanity as a whole. An underlying premise is to create a living legacy to the wolves and the strength of the human spirit. The initial plans for the complex include 3 multi-acre compounds with open-air habitats for the wolves. The habitat size will increase from the current 500 sq ft to 3,500 sq ft, with smaller night enclosures in each habitat. The enrichment fields will increase from half an acre to between 2 and 5 acres, thus allowing the wolves more room for play and exercise; yet assuring human access and the animals’ well being. Each compound will have a tee-pee, medicine wheel and learning center for The Wolf Connection Team’s first project. 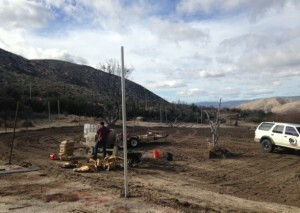 The first compound is underway for the teaching programs. As soon as the first compound is completed, the existing pack of 28 will move. Wolf Connection intends to rescue and rehabilitate an additional 30 to 45 wolf-dogs and run concurrent life-changing programs for about 2500 at-risk youth annually. These changes will significantly increase Wolf Connection’s positive impact on youth who so desperately need a chance to succeed and transform their lives. 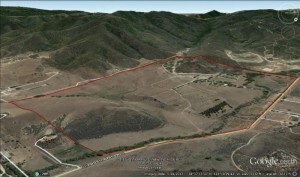 Besides the larger and more expansive habitats and enrichment fields for the animals, the long-term vision for the new ranch includes extensive hiking trails, which are essential to Wolf Connection’s programs, on-site residential facilities that will allow for more long-term programs, such as summer camps and continuation schools, and housing for those youth transitioning from foster care, probation, or substance recovery to independent living. The vision continues with an organic garden, sustainable and green buildings, a labyrinth for walking meditations, Native American tee-pee, teaching and fire circles, and ultimately a facility for corporate retreats to help supplement ongoing funding needs. The dream is to have multi-purpose rooms, an art studio, science lab, and library. Wolf Connection will offer internships and on-site job training in facilities management, green technologies, gardening, animal care, cooking, construction, and film making, besides offering workshops in woodworking, metal working and a variety of other disciplines. 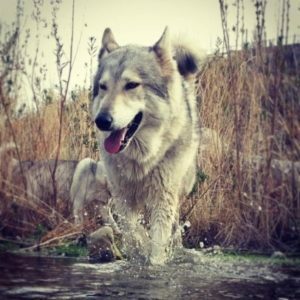 Wolf Connection is currently the only known charitable organization which rescues wolfdogs and uses them to rehabilitate humans (especially teens) suffering from addiction and emotional issues, through use of its unique “wolf therapy” programs. Like many of the youth involved in the Wolf Connection programs, some of the wolf pack members were abused, neglected, abandoned, misunderstood or unloved. Teo has designed the programs based on wolf principles — wolves are always ok with who they are, wolves are into being rather than doing, they give 100% to everything they do, they work together to succeed, and they let go of the past and make room for new things in their lives, all traits Teo tries to foster in the humans who arrive at the Wolf Connection gates often feeling defeated, isolated and hopeless. 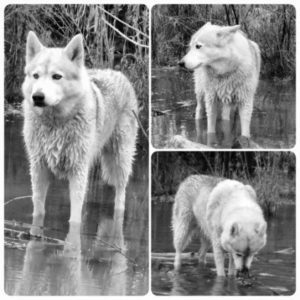 The clients are on a healing journey, sometimes quite parallel to the healing journey of some of the wolves. 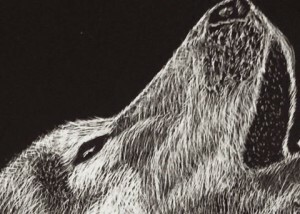 It may be the wolf who assists the human in making a deeper connection to self. Other times it may be the human that assists the wolf’s healing. Often it turns out to be a collaboration of both. At Wolf Connection, we believe that the deep and conscious understanding of our relationship with animals and the environment is pivotal to our development as strong individuals, productive societies, and as a sustainable civilization on this planet. Wolf Connection asks you to help make this vision a reality for the benefit of all. If this vision is compelling and you want to be part of it, in a grand or a small way, please contact Cate Salansky, Lead of Donor Relations, at csalansky@wolfconnection.org. Written by Julie Bloomer, author of Gracie’s Tail: Conversations with DoG, available on Amazon or Barnes&Noble. profits from the sale of this book will be donated to Wolf Connection. Relationship with a wolf….. How many humans believe that they can dictate and navigate the twists and turns that will be in relationship? How about in relationship with a wolf? 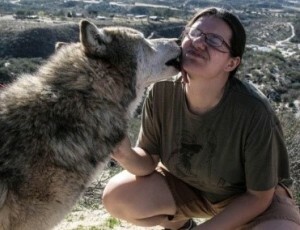 For one volunteer, who became kennel crew, being in relationship with a particular wolf was an extra honor. The nature and expression of that connection became a series of lessons in awareness and acceptance…. Miko was an exquisite presence of love, greatness, sweetness and primal power. A very large female grey/arctic mix, she was a sight to behold and with which to commune. One volunteer worked diligently to reach the level to be able to interact with her and eventually walk her on leash. For about a year, the volunteer enjoyed including Miko in the kennel crew and handler activities…. a capable handler and from that moment on, the relationship took a new turn. No longer could the volunteer hike or touch Miko. The new relationship was one where the volunteer could enter the kennel, clean up, change the water and offer food and no more. Wolf Connection kennel crew are warned that this may happen- but how to react? Does one take it personally and wonder if they are less than in some way? Consequently, when there is a close bond, would it then mean that one is more than in some way? It is what it is…. As it was, the volunteer continued to love Miko by respecting the boundaries. The kennel was cleaned; food and water were provided, without ever an attempt to pet Miko. About a year later, when Miko became disabled, and was feeling vulnerable and needed extra care, seeing how uncomfortable Miko was by her presence, the volunteer arranged to have newer kennel crew, with whom Miko seemed bonded, to be trained by the behavior specialist so that they could care for Miko instead, providing a calmer healing environment. When Miko’s disability progressed to the point that she could potentially injure herself due to jumping around when team members with whom she was happily familiar entered her kennel, the old volunteer was called in to care for Miko. Not jumping in joy to see this volunteer, Miko’s injury was now better aided on certain days by the one kennel crew she only tolerated. For a few months, the volunteer tended to Miko’s wound on her days; bathed her and cleaned her kennel a few times a day. While bathing Miko the volunteer was conscious not to “pet” Miko but rather kept the touch to its purpose of bathing so as not to take advantage and to continue showing the utmost respect. When the decision was made that Miko’s life was drawing to its end as the progression of her disability was quickly diminishing her quality of life, the volunteer had no need to enter the kennel and Miko showed that the allowance to enter was no longer. Once again, the volunteer would only be tolerated from afar. The volunteer said farewell to Miko from a respectful distance and felt the loss as did those with whom Miko was deeply bonded. There was still a bond- a connection and a relationship of deep respect and acceptance… it just looked “different” from some of the other bonds…. Because the volunteer had been aware and accepting of what was… she received many blessings: lessons in awareness, acceptance and choice. A privilege to experience. What blessings might you receive from this journey? Written By Wolf Connection’s Lead of Programs, Giulia Cappelli. Last week, Chance was given the diagnosis of a rapidly growing colon cancer. The veterinarians and oncologists who assessed Chance were all shocked that such a strong, healthy animal was, in fact, dying. Based on recommendations of the specialists and Chance’s current energy, Chance will be receiving radiology – starting this week – to deter the growth of the cancer, reduce the size of the tumor, and give Chance more time. If the treatment is effective, it will add many more months to Chance’s life AND, the best news, it can be repeated down the line to add more time to his young life. Please keep Chance in your thoughts and hearts this week as he bravely faces these life-saving treatments. And stay tuned next week for an update on Chance’s health after he completes his first series of treatments. Chance’s care and the care of the entire pack is funded through the generosity of our community. Please contribute to the Moonshadow Emergency Veterinary Care Fund or SPONSOR CHANCE for 2016 to support Chance’s radiation and cancer treatments. The Veterinary Oncology Group of Los Angeles is graciously reducing the cost of Chance’s treatment, but each round of treatment is in the thousands. Please help us provide the necessary health care for Chance without cost as an obstacle. 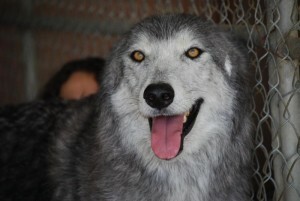 Chance is a high-content wolfdog that joined Wolf Connection after having been rescued from a roadside attraction in Alaska. Chance and his younger brother, Koda, are strong and loving animals that frolic and play together, bringing much joy to anyone who observes them. The State of Alaska condemned the roadside attraction and criminally charged the owner while ordering Chance, Koda and the thirty-one wolves to be euthanized. Chance endured the first three years of his life tied to a post with a chain around his neck that froze into his fur, eventually growing into the skin of his neck and rendering him sentenced to walking in one direction so as to not rip the chain from his skin. While Chance was first being rehabilitated, it was heartbreaking for Wolf Connection staff to witness his trauma. When his fear was activated, he would drop to his belly with his paws gripping at the dirt as if he was trying to hold on. His other fear response was to walk quickly in a circle because that was his only coping strategy when he was chained to a post. It was a privilege to assist him in moving past his fears and to watch him learn how to do physical activities in a new way. Despite his fear at the sight of man-made objects and the physical neglect and abuse he endured, Chance has learned to walk on leash with the patience and love of the Wolf Connection staff. He will practically leash himself and is quite demanding to being taken out on walks! Our fondest wish for Chance is to give him a home that provides him with everything he missed during his first years! A large habitat, with water to play in, plants to hide behind, and space to roam. This will be a reality at Wolf Connection’s new home – early May 2016. We hope that Chance has many more months, perhaps another year, to enjoy his beautiful new home with his baby brother, Koda. Program participants are honored to be present for him. In fact, Chance has so many people who focus on their intention to help him, it has been amazing to witness Chance supported by so many participants lovingly present for his healing. Everyone benefits! Chance continues to heal, share and rehabilitate. He is full of love and he shares it freely. In fact, the very strong-bodied Chance is affectionately known as the Linebacker of Love because he tackles staff with playful kisses and bosses around his younger sibling, Koda, as big brothers do. Wolves are one of the most adaptable species on planet Earth – one of the few that lives in almost all habitats. A recent article in National Geographic highlights this adaptability with a profile of the “Sea Wolf” – coastal wolves on the western edge of Canada who get 90% of their prey from the sea, and have been known to swim as far as 8 miles from island to island! Click HERE to read the National Geographic article “In Search of the Elusive Sea Wolf Along Canada’s Rugged Coast”. Submit your artwork throughout March to wolfconnectionteam@gmail.com to have your design selected and featured on Wolf Connection’s 2016 Limited Edition T’s. Be a part of our most memorable year to date – the year the pack came to their forever home! Our 2015 champion, Linda Goode, designed an incredible image of Annie that donned our 2015 Limited Edition t’s, bringing much needed funds and awareness to Wolf Connection. Now you can too! Cheers and good luck! 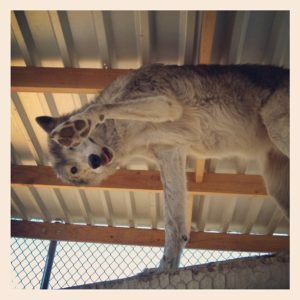 Come visit the Wolf Connection Ranch March 20, 2016 and meet your wolf pack! Visit our Event page to sign up. 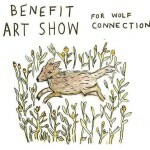 Celebrate Wolf Connection with unique art, live music and the Wolf Connection Team! Register HERE. Moving day is finally here! Stay tuned for your invitation to be a part of the pack’s final journey and witness them meet their new home at the Wolf Connection Ranch – May 7, 2016! Email volunteers@wolfconnection.org to share your interest and receive times and location details. Donate and Recurring Donations – Recurring donations throughout the year could lead to a Wolf Sponsorship and are automatic! 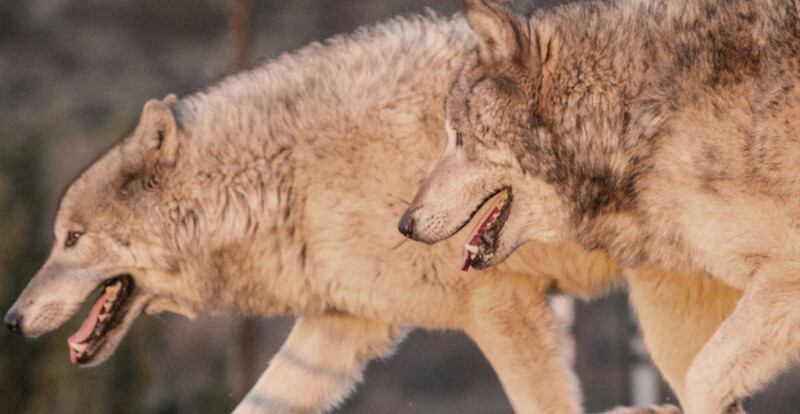 Build a special connection with your wolf, visit them at the Wolf Connection Ranch during your sponsorship, receive an HD image by our wildlife photographer with your wolf’s bio, and receive a bottled tuft of your wolf’s fur to keep them always close. Wolf Connection Wish Lists on Amazon – Amazon makes it easy for you to purchase needed products and give your donation directly to your pack! While you’re there, don’t forget to sign up for Amazon Smile and select Wolf Connection as your chosen charity so that a percentage of all your shopping comes to Wolf Connection, how easy! Ship to PO Box 504, Acton, CA 93510. Build Your Own Campaign – Gift your birthday or promote your favorite wolf! Campaigners in the past have reached their goal of sponsoring their wolf! Own a Business? See how your sales can support Wolf Connection at no cost to you! Contact Cate Salansky to learn more at csalansky@wolfconnection.org. Pledgeling – This new app allows users to give to their favorite charities from their smart phone, without having to enter credit card info!